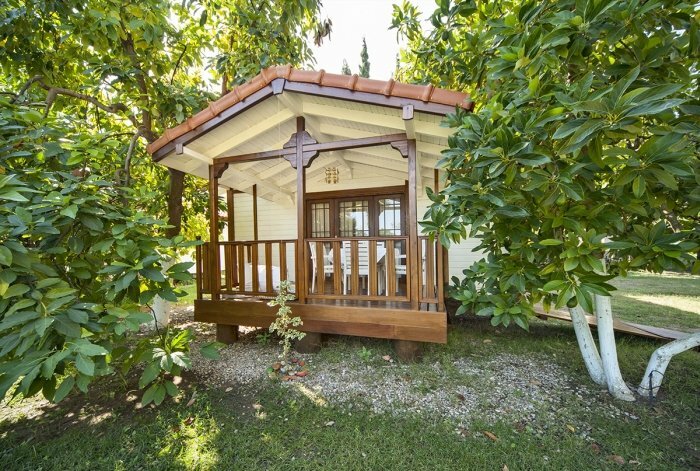 At Akdeniz Bahcesi (the “Mediterranean Garden”) eco-resort, we offer five self-catering holiday cottages situated in an organic fruit orchard, just 100 meters from the Cirali beach. 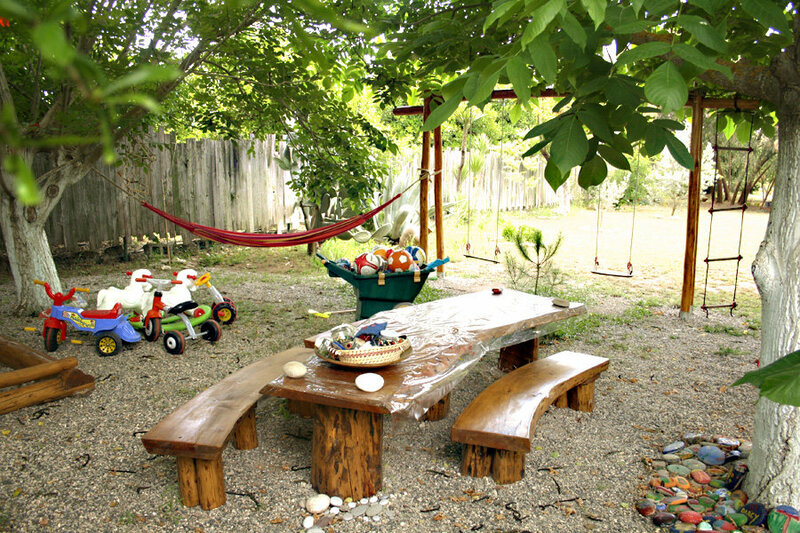 We provide a peaceful, family-friendly destination with plenty of space where children can play and adults can unwind. 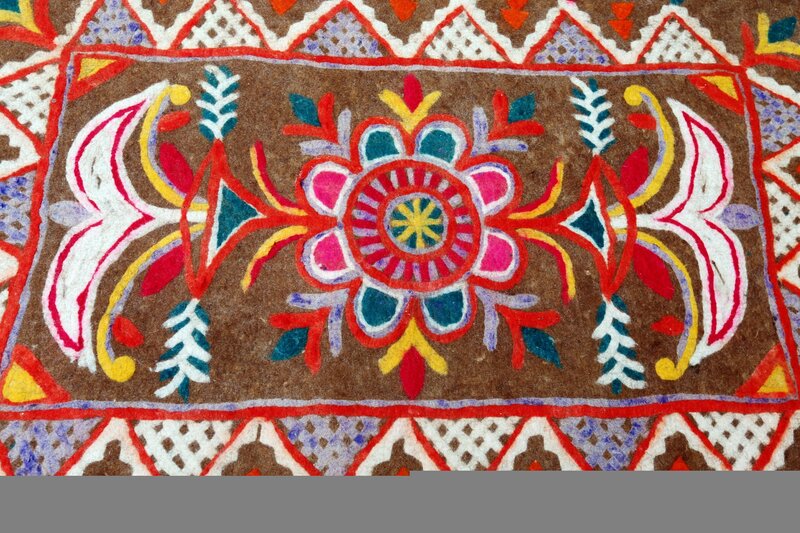 We also offer traditional weaving workshops and eco-friendly craft activities. We have five adult-sized bicycles (two of which have a child seat) and two bikes for kids; you may borrow them any time for free. 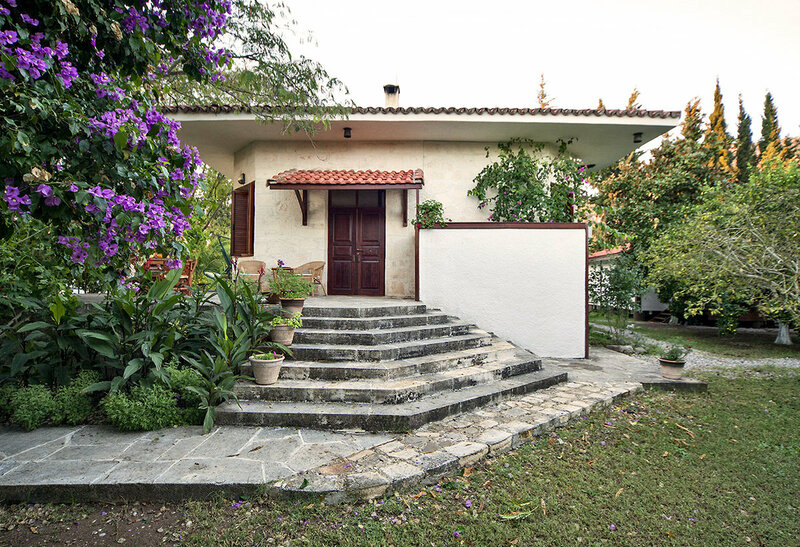 Our comfortable, self-catering holiday cottages open onto shaded verandas and are surrounded by fruit trees and fragrant flowers. 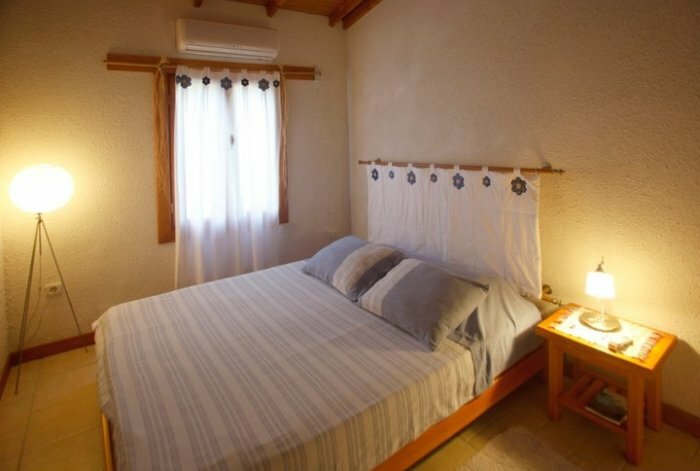 They are equipped with a kitchen and provide wi-fi access, air-conditioning, baby cots, and high chairs – everything you might need for a family holiday. 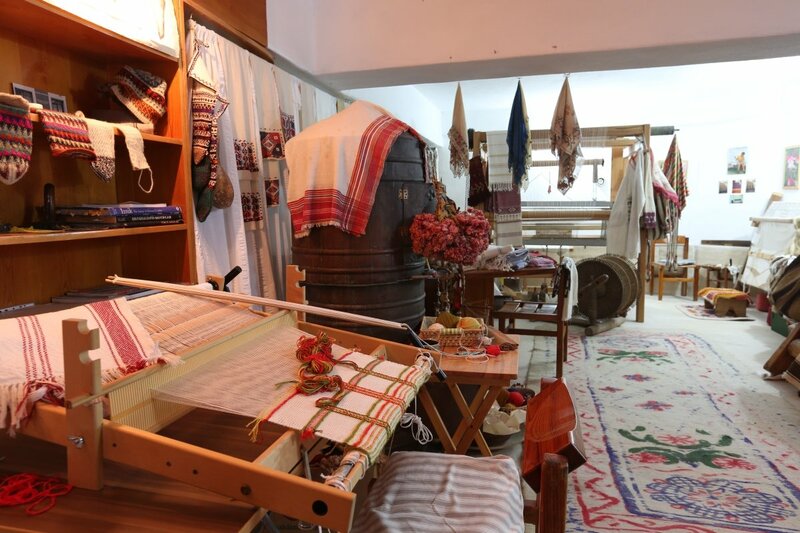 All of our houses are fully furnished and decorated with Serpil's handmade textiles. 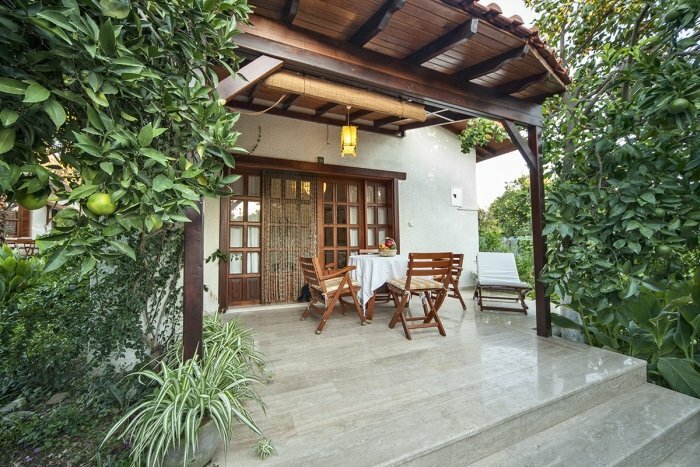 Meals are served on our beautiful stone patio shaded by sycamore and avocado trees. We prepare traditional Turkish and Mediterranean dishes using as many local and natural ingredients as we can. 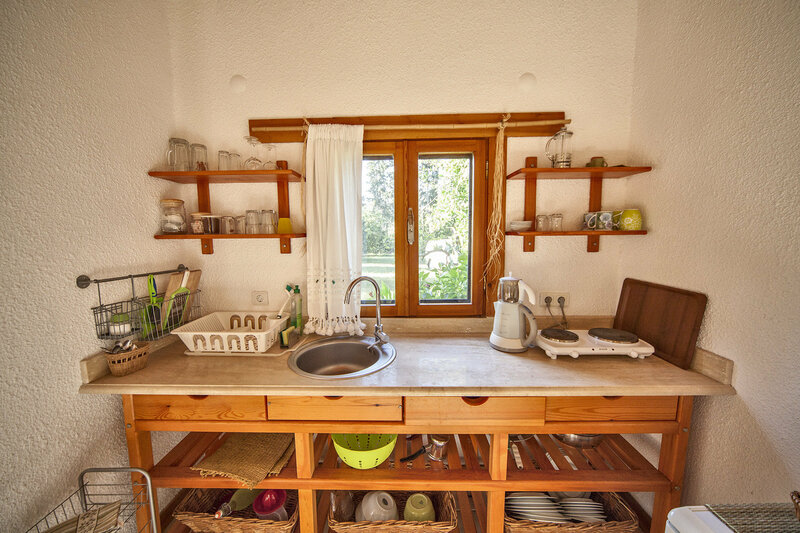 In the evening we prepare a homecooked meal using fresh, seasonal vegetables and certified organic olive oil. Guests have a choice of meat, fish, or vegetarian main course as well as a variety of Mediterranean and traditional Turkish side dishes. Our dinner menu costs 15 Euros, which includes 4 types of dishes and a homemade dessert. Every morning we serve a traditional Turkish breakfast, with a spread of fresh vegetables, cheeses, olives, and jams which are made with fruits from our own garden. When we can find fresh milk, we make our own yogurt, and we have fresh, local free-range eggs cooked to order. Every day we serve a different natural juice as well as Turkish tea and filtered coffee. 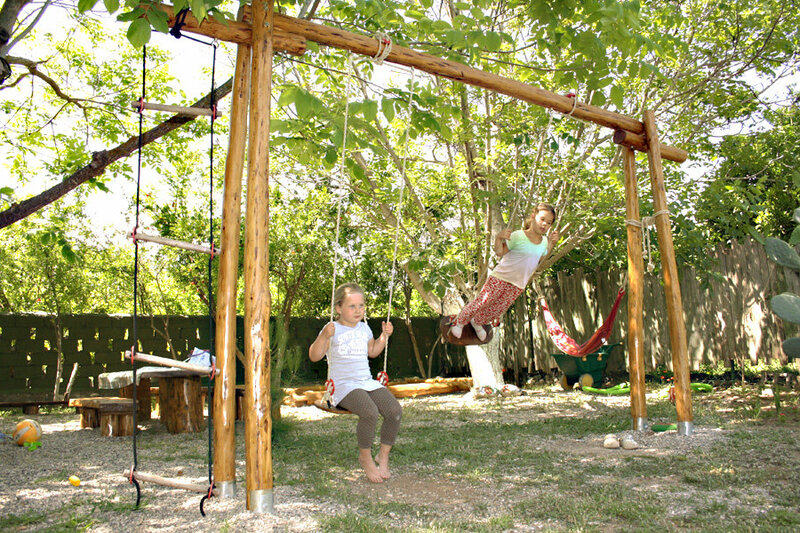 We love providing a place for memorable family holidays in Turkey, so a large part of our garden is dedicated to children. 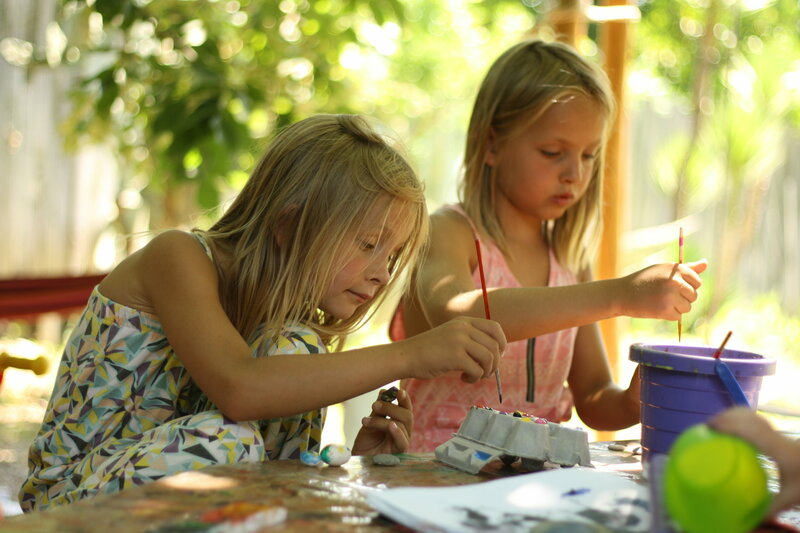 We have a safe, fenced-in playground with a sandpit and swings for kids of all ages, plus hammocks, toys, kids bikes, and a table for painting and other craft activities. 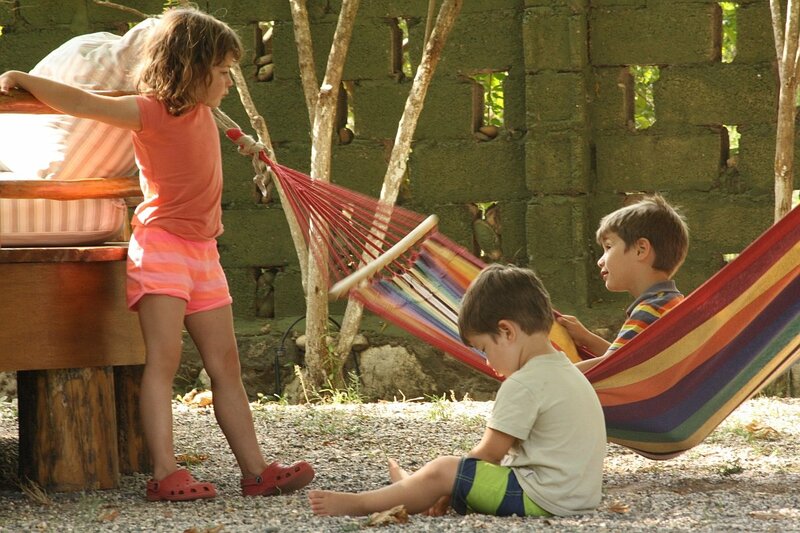 We strive to be the most comfortable and family-friendly of the Cirali hotels. 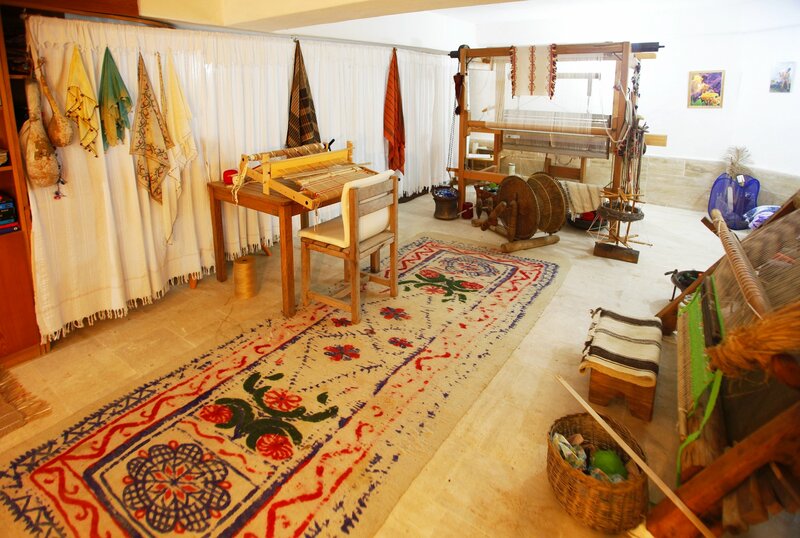 At our art studio, you will discover examples of Turkish traditional weaving, and even try to learn how to weave. 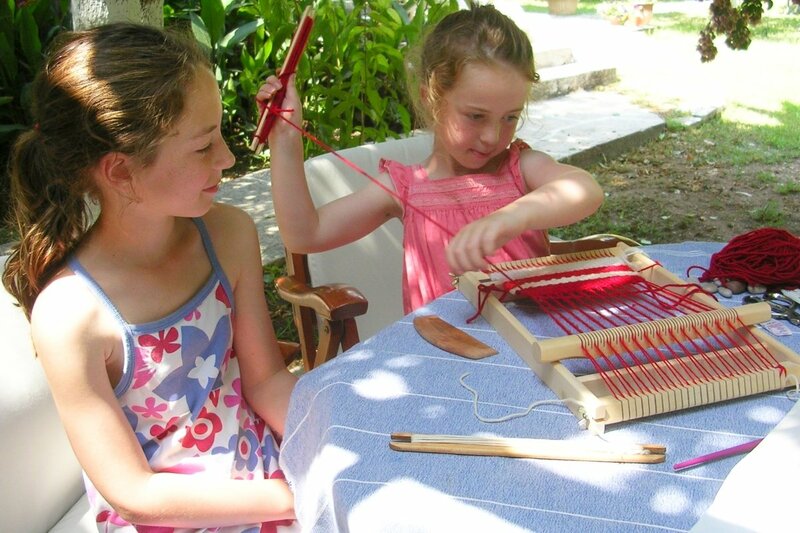 We have 4 different types of weaving looms as well as smaller looms for the kids. 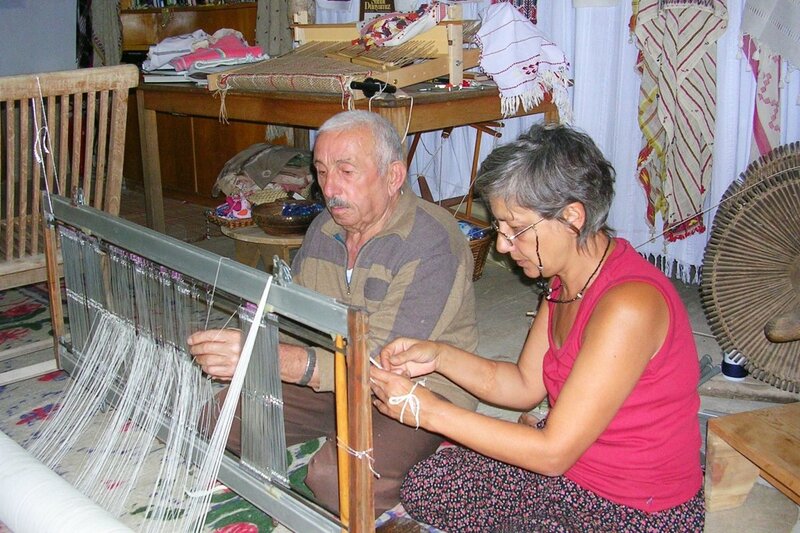 To check out the studio and to learn more about weaving, just find Serpil and she will give you a tour. 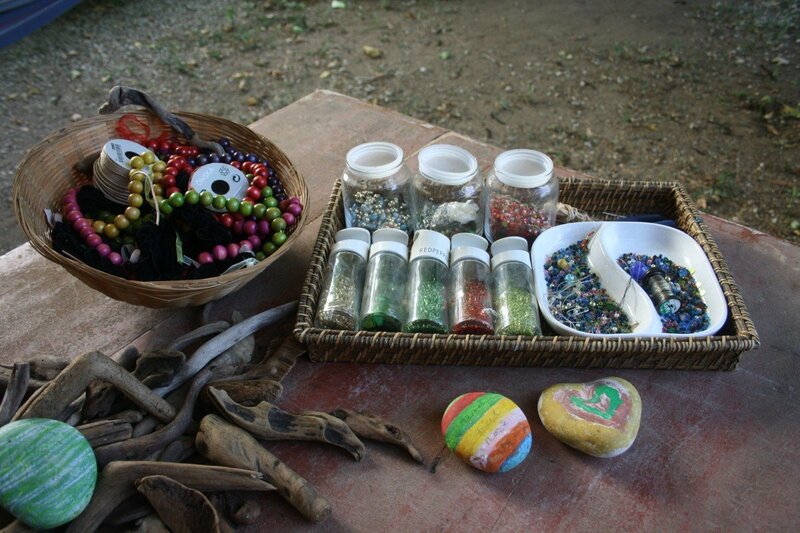 In the studio we have many raw materials for weaving your own textiles, as well as a collection of beautiful finished products available for purchase. 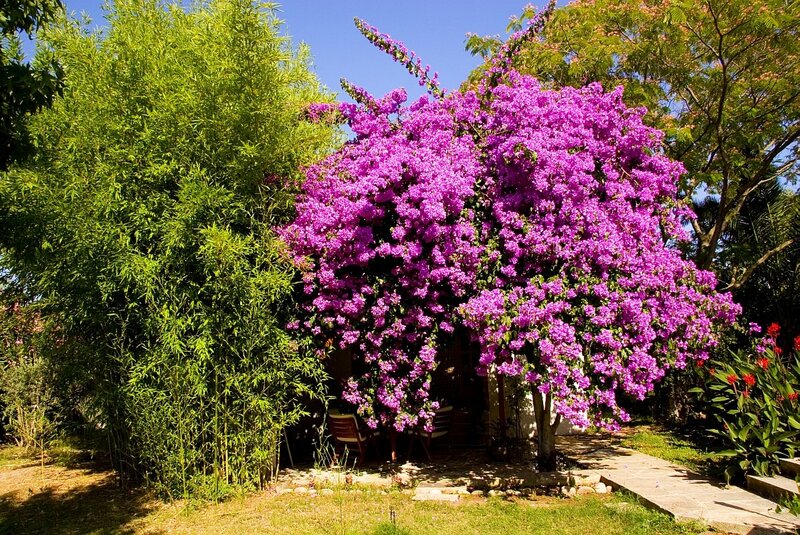 The natural flames of the Chimeara (Yanartas in Turkish) is one of the wonders of the Antalya region. The continuously burning flames used to be a natural lighthouse for the sailors of ancient times. The best time to visit is at night, and takes about a 20-30 minute walk. Explore the ruins of the ancient city of Olympos after a 20-25 min walk along the Cirali beach from our garden. Olympos used to be a rich port city for centuries – it was once even used as a base by pirates – and is now an open museum with many ruins hidden throughout the forest. If you like sailing, do not hesitate to try the boat tours in Cirali. From 10:00 till 17:00, you will discover the local uninhabited beaches around Cirali to the Adrasan direction. You can book these tours through several local companies, and lunch is included in the price. From the middle of July till the first week of September, a surprise awaits the visitors of Cirali. Baby Caretta Caretta (Loggerhead) sea turtles start to come out from their nests. 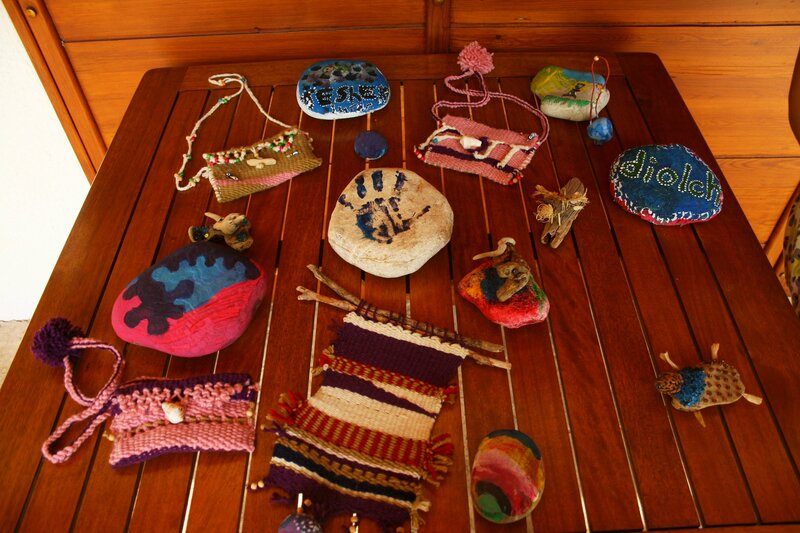 To watch them make their journey to the sea, head to the beach around 06:00 and join the group of volunteers. Cirali village offers many oportunities for hikers and cyclists. There are several paths around the village for walking. 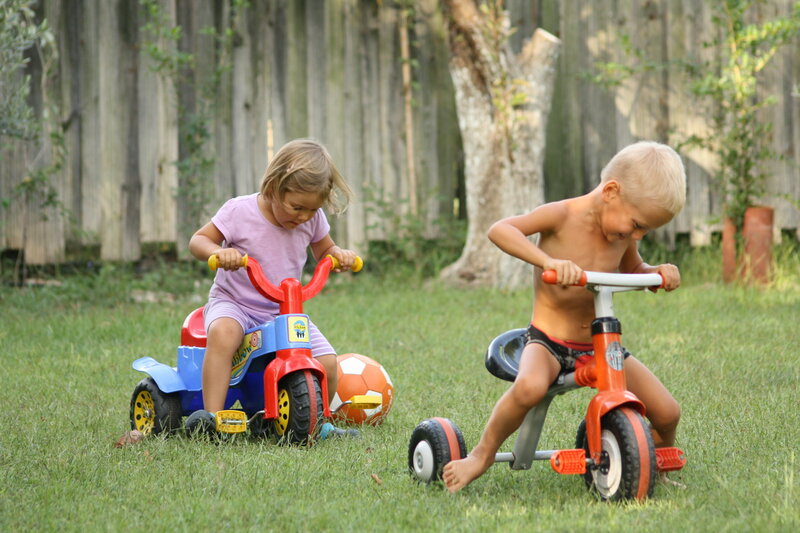 For those who love biking, we have 5 adult bicycles, 3 of which can be attached with child seats – you may borrow them without any charge. The Lycian way is a world renowned trekking path that stretches more than 500 km from the city of Fethiye all the way to Antalya. In Cirali, you can hike along a section of this historic trail that offers stunning views and access to secluded, crystal-clear beach coves. Founded by the Greeks of the Rhodes, the ancient city Phaselis can be visited by local tours, or by car just a 30 min trip from Cirali. Once an important member of the Lycian Union, there are many well preserved ruins in this ancient city, as well as two beautiful beaches. Officially 2365 mt high, the Tahtali mountain is the highest point in the Antalya region. Experienced hikers can climb to the top with a guide, while families can take a cable-car all the way to the top to see stunning 360 degree views of Antalya.